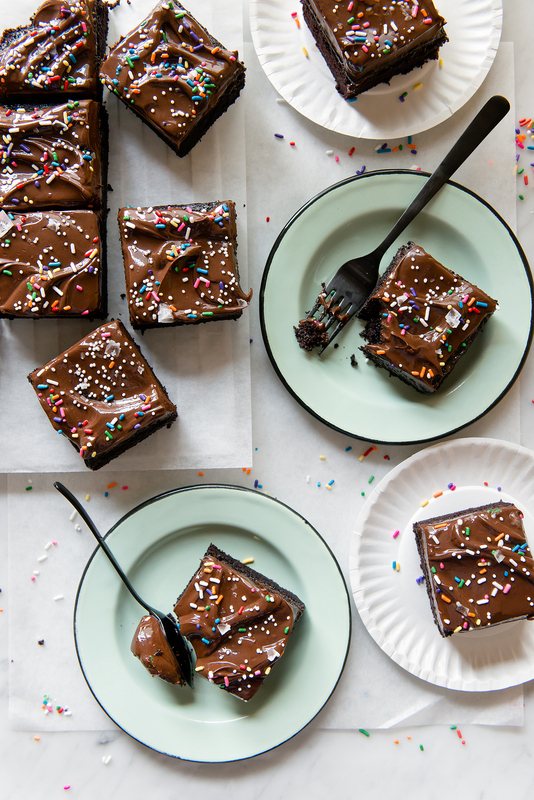 Chocolate Sprinkle Snack Cake is on the dessert menu today. It’s an edible representation of what this summer is going to be. A busy one and even on the busiest days, this recipe can be pulled off and enjoyed. I’ve been thinking about how to keep up with this blog during the upcoming months and my intention is to make time for it as much as possible. The recipes will probably be less elaborate, but honestly, I love simple baking recipes. For all the glamour of French pâtisserie, my “if you were stranded on a deserted island and could only eat one dessert for the rest of your life” it would probably be a chocolate chip cookie (or chocolate cake… or a croissant…). Simple baked goods are comforting to eat and exactly what my mind goes for after a busy day. One of my favorite baking challenges is to make one basic baked good really well. Like the aformentioned chocolate chip cookie. Ever try to find the perfect chocolate chip cookie recipe? Yeah, good luck. It’s my life’s quest and every time I think I’ve found it another recipe shatters that cookie-glass ceiling. Anyhow, the more you bake the more you learn about baking. It’s an evolution. You eventually learn that not all chocolate chip cookies are created equal, or any baked goods for that matter, but that every recipe you make is a learning experience in technique and taste. You learn to stop judging a recipe as “good or bad”, but as “that’s not my taste” or “that’s not my taste anymore.” Baking is personal. For me, my tastebuds love classic recipes and that hasn’t changed over the years. What has changed is the quality of ingredients that I’ll use to create them. Take today’s recipe: It’s a classic chocolate cake and chocolate frosting recipe, but it’s made with really excellent chocolate. Years go, that wouldn’t have mattered to me. It definitely does now. So, I’m going to enjoy creating really great-tasting simple baking recipes this summer made with really great summer ingredients. Like this chocolate snack cake. It’s designed for those moments of intense chocolate cake cravings. One that you can whip up, bake, and eat that same evening. The servings are a thick single layer of cake, with silky chocolate frosting, and just right for a sweet moment without over indulging. We all need recipes like this in our baking arsenal. Solid recipes that will rise to occasion and comfort us when needed. * The chocolate frosting for this cake is very soft; which is why it’s great for spreading onto a single layer snack cake. It’s more buttery-chocolate in flavor than it is sweet and doesn’t leave a sugary aftertaste. If your frosting comes out too soft, then pop it in the refrigerator to firm up (stirring every few minutes until it’s the desired consistency). *When adding the soft chocolate frosting use a light hand to spread it on. First, dollop thick mounds onto the cake and then lightly spread the frosting around until it almost reaches the edge of the cake. Keep dolloping on more, as needed, to keep the frosting layer thick. Otherwise, if you just spread it out in bold strokes you’ll end up with an extra thin layer of frosting that sadly droops over the edges of the cake. It’s more about shaping this style of frosting on, not so much spreading. * You’ll more than likely have leftover frosting. An intentional recipe choice, as I wanted you to have plenty of frosting for creating big beautiful swirls. Leftover frosting is not a bad thing and can easily be stored in the freezer until the next chocolate cake craving hits. Preheat oven to 350F (177C). Line an 8×8-inch square baking pan with parchment paper. In the bowl of a stand-mixer, whisk together flour, sugar, cocoa powder, baking powder, baking soda, and salt. In a separate bowl, whisk together sour cream, oil, egg, and vanilla extract. Using the paddle attachment, on low speed, add the wet ingredients to the bowl and mix just until combined. Stop and scrape down the sides and bottom of the bowl. On low, slowly stream in the hot espresso/coffee and mix to combine. Pour batter into prepared baking pan. Bake for 30 – 35 minutes, until a toothpick inserted into the center of the cake comes out clean or with minimal crumbs. Remove from oven and set on cooling rack for 15 – 20 minutes. Using the parchment paper sides, gently pull the cake from its pan and set back on cooling rack to finish cooling. Chocolate cake can be plastic wrapped securely and stored in the freezer for up to 1 month if desired. 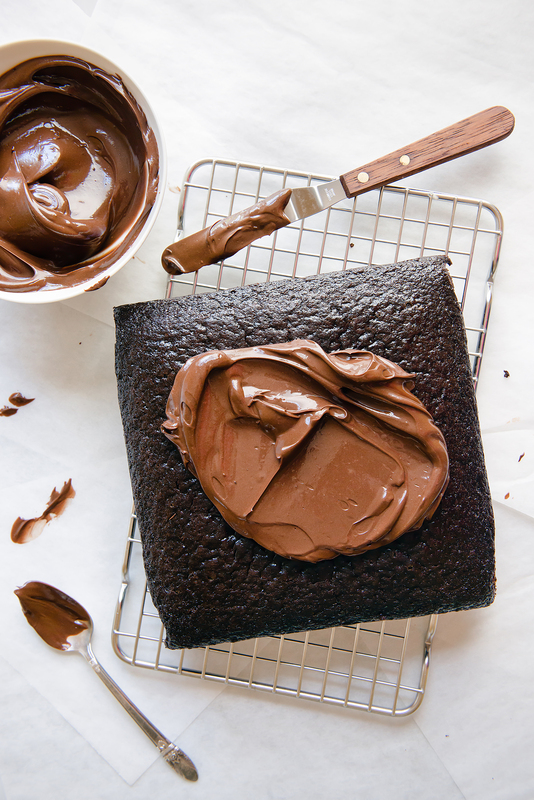 Once the cake has cooled completely, dollop on the dark chocolate frosting in thick mounds around the top of the cake. 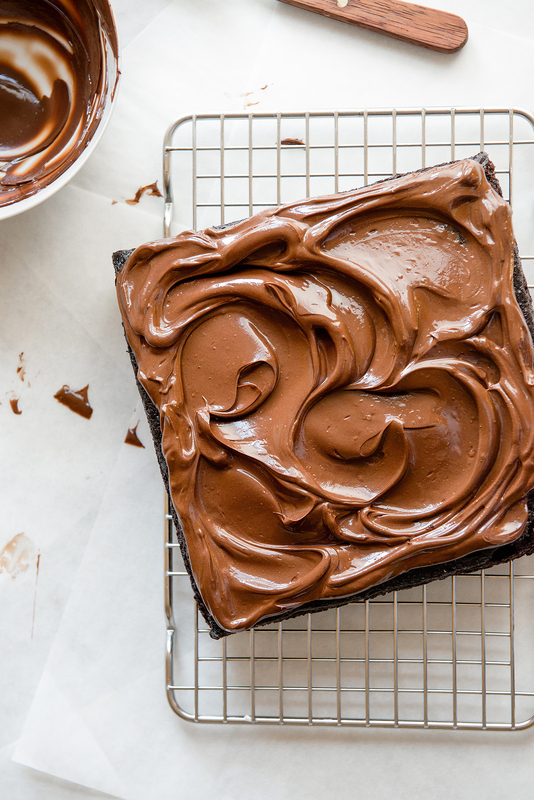 Using an off-set spatula, or a spoon, lightly begin moving the frosting towards the outer edges of the cake in small motions; leaving about a 1/4-inch border around the edge. Dollop on more frosting as needed. Tip: Try to avoid using a heavy hand here – just lightly press the surface of the frosting around so that it remains in a thick layer. Make light swooping motions with the spatula to create nice indentions into the frosting. 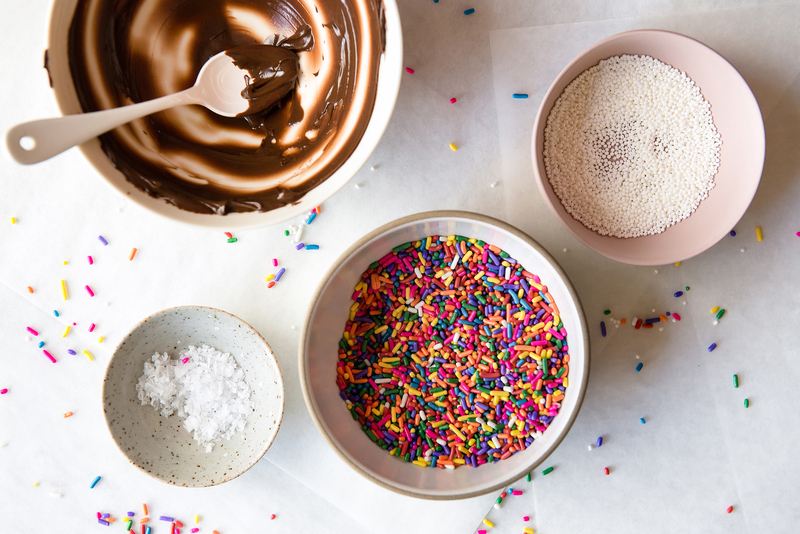 Sprinkle generously with rainbow sprinkles, nonpareils, and flaky sea salt. Cut into nine squares (or however small or large you want) and serve. Store leftover cake, in an airtight container, at room temperature for up to five days. In a heat-proof bowl, gently melt the dark chocolate over a double boiler (a pot of simmering water with the chocolate bowl snuggly fitted on top). Or, place the bowl of chocolate in the microwave and melt in 30 second intervals, stirring between each heating, just until melted. Take care not to burn the chocolate with this microwave method. Set the melted chocolate bowl aside until cool to the touch. In a small bowl, combine the cocoa powder and hot water until smooth. Set aside until cool. In the bowl of a stand-mixer, fitted with the paddle attachment, cream the butter until fluffy, about 1 minute. Add the powdered sugar and salt. Mix, on low, until combined and then increase speed to medium-high and mix until fluffy, about 2 – 3 minutes. Add vanilla and mix until combined. Stop and scrape down the sides and bottom of the bowl as needed. On low, add in melted chocolate and mix until combined. Scrape down bowl and add in cocoa mixture. Mix until thoroughly combined. The frosting will be soft, but if you prefer it firmer simply place it in the refrigerator to firm up (stirring every few minutes until it reaches the desired consistency). 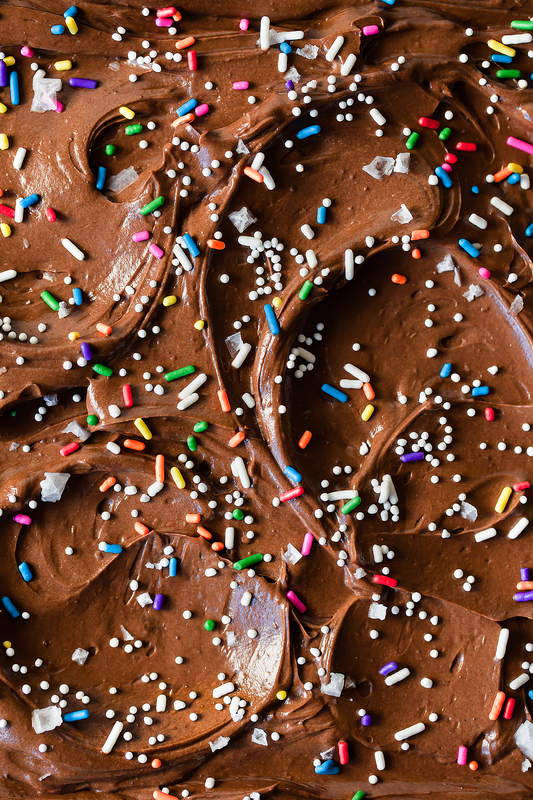 Store any leftover chocolate frosting, in an airtight container, in the freezer for up to one month. Dark Chocolate Frosting Recipe Adapted from Cupcakes by Martha Stewart. This looks amazing, you hardly ever see square cakes anymore – this is so refreshing. I love chocolate cakes like this with coffee in, they are so moist and delicious. The icing recipe looks really tasty too. Thank you, Angela! I love chocolate cakes with a little coffee in them too. So good. I love that it’s called a ‘snack cake’. We don’t have ‘snack cakes’ in New Zealand, so the name always gives me a giggle! I’m not sure what we do call it though! I gotta make more snack cakes! haha. Teresa, thanks for a great recipe. I’ve made this twice now, once in a square 8″ pan and once around 8″ pan. The cake is very nice, especially with the addition of Valrhona cocoa powder and a good french roast coffee or espresso is always a good substitution for water in a chocolate cake. The frosting was very rich and flavorful. Thanks again for a really nice recipe. I’ll be making this often. You’re very welcome, Thomas! Happy to know that you’ve been enjoying it and thanks for stopping by to share.